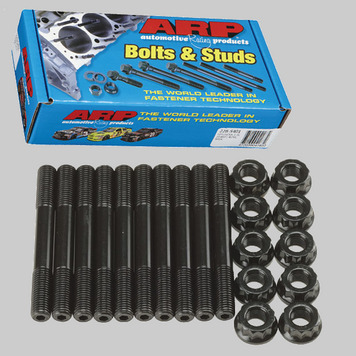 If you are building a bullet proof UZ series V8, you will need the ARP Stud kits found here. When racing professionals in NHRA, IHRA, NASCAR, and Formula 1 competition need bullet-proof fasteners for their high-performance machines, they turn to one company: ARP. Since 1968, Automotive Racing Products has been engineering and perfecting bolts, studs, nuts, and other fasteners for engines, cylinder heads, headers, wheels, transmissions, and more. ARP uses only top-quality materials—far above the usual “aerospace quality” others settle for—in a highly exacting manufacturing process to create fasteners with the strength and durability to last race after race. Vehicles that came with these engines include SC400, GS400, LS400, SC430, GS430, LS430, GX470, LX470, Land Cruiser, Tundra, Sequoia, and Celsior, Soarer, Aristo, and Crown. SupraStore leads the world in Toyota/Lexus V8 parts!